The more I thought about it, the more a ‘typical’ way of life seemed constricting. I’d read research showing that once basic material needs have been met, more stuff doesn’t necessarily make people happier, so could I go without the mod cons of Australian life? Did I need a plasma TV? A stereo system? A designer shirt to hang in the closet? If I learned to live with less, could I spend fewer hours working to pay for everything? Meanwhile, Sophie ached to go travelling, but we were concerned about carbon emissions and didn’t want to fly. Somehow, all these fears, theories and desires combined into a single, rather unlikely quest: we would travel up the east coast exploring simpler and alternative ways to live. In keeping with the ethos of our mission, we would do it in a simple and alternative way: by bicycle. As you can imagine, the first few thousand kilometres were a tremendous shock. My thighs ached, and the tendons in my knees twinged with the repetitive strain of pedalling. I didn’t know bike shorts were supposed to be worn without underwear, and the seams of my boxers chafed my skin, leading to painful blisters. The people we met, however, made all the physical discomfort worthwhile. In an old-growth forest in Tasmania, I was hauled 60m up a tree to interview an activist who had been living on a platform at the top for five months. In the hills northeast of Melbourne, we spent a week at an intentional community – yes, that’s a euphemism for ‘hippie commune’ – that had been going since the early 1970s. Our trip was partly inspired by the 19th-century philosopher Henry David Thoreau, who wrote the classic text Walden (1854) about his own experiment in simplicity – the two years and two months he spent living in a hut in the woods in Massachusetts. In Victoria’s goldfields region we met an architect named Peter Cowman who had also built a very basic shelter. Called an EconoSpace, his quaint little cottage measured a modest 10 square metres and cost less than $3800 to build. Thoreau wrote that “the cost of a thing is the amount of what I will call life which is required to be exchanged for it”. Cowman seemed to have a similar outlook: a less expensive house meant less time working to pay it off. “If you don’t have a mortgage, you don’t have to have a regular job. you don’t have to sell your time,” he said. you can then use that spare time to “find out who you are”. This, I learned, was the essence of ‘downshifting’ from the so-called rat race. In choosing time over money, you’re exchanging material wealth for other types of wealth: close relationships, inner richness, the pursuit of meaning. Depending on your circumstances, voluntarily reducing your income can actually increase your quality of life. Further north, we bumped into some even more inspiring and eccentric characters. There was the chef in Bemboka, NSW, who had organised a gourmet banquet for 150 guests using ingredients from within a 10km radius. There was the permaculture teacher living simply in one of Sydney’s wealthiest neighbourhoods, tending a tiny vegie patch next door to a multi-million-dollar mansion. And there was the man who had lived in the bush near Armidale without electricity for about 20 years. He called himself a ‘living historian’ and would trek through the forest equipped with only 18th-century tools and clothing. Most of these interviews were pre-arranged, but our journey was also blessed by serendipity. In Far North Queensland, we heard about a ‘barefoot monk’ who had walked up the state carrying only three robes and an alms bowl. As we cycled along the Bruce Highway towards Bowen, we spotted him sitting cross-legged under a tree, his back to the hurtling traffic. “I wanted to see if it was possible to live the old way with just three robes and bowl in Australia,” he told us. “I thought if I could walk from the Gold Coast to Townsville, I could prove you could do it.” I looked down at the soles of his feet, which were as black and calloused as a dog’s paws. “We have as much ability to adapt to the environment as animals,” he said. His words proved prophetic. Gradually, without me even noticing the change, I adjusted to a slower pace of life. By the time we reached the wet tropics I enjoyed the simplest things: wind on my skin, sun on my back, a view of a swaying palm tree. I had started to appreciate the environment not because it had become prettier but because, after spending so much time outdoors, I felt a part of it. Our final destination was a ‘Global Elders Gathering’ on Indigenous land near Cairns, where we witnessed the total solar eclipse. We woke at dawn and stood on a beach facing east, watching through tinted glasses as the moon slid in front of the sun, plunging the surroundings into an eerie twilight glow. A golden splinter passed across a mountain range to the south, and then all was dark. I smiled. Before the trip I had felt hemmed in, lacking options. But after more than eight months on the road exploring some fairly radical alternatives, I felt the courage to forge my own future, whatever that might be. I didn’t want to emulate the more extreme examples we had encountered, but I had learned to appreciate that there are varied ways to structure a life – you just have to be aware of the risks and trade-offs. Sometimes friends ask me what was the greatest lesson of the trip. They probably expect me to lecture them on how they should live, but instead I say this: be true to your own values. Time is too precious to spend decades doing something you hate, so arrange your life in way that allows you to focus on what’s important to you. Clear the clutter to make room for your passions. And then, I say this: if you have a crazy idea that seems impossible, don’t be afraid to try it. This is a summary of my book Changing Gears: A Pedal-Powered Detour from the Rat Race. 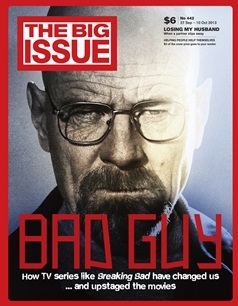 It was first published in The Big Issue.